Legacy 2030 | Winston-Salem/Forsyth County Planning Board: What is Legacy? Legacy is Forsyth County's comprehensive plan -- the official public document that guides the growth and development of the community. The title, Legacy, identifies the overarching theme – we are stewards of the community and we have an obligation to protect and enhance it as our legacy to future generations. 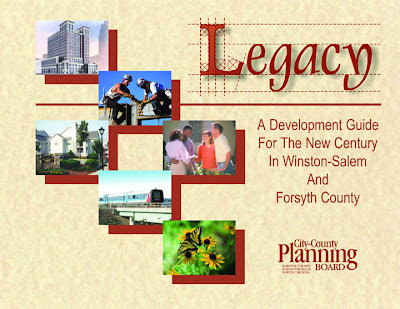 The original Legacy Plan, adopted in 2001 by Winston-Salem, Forsyth County and the seven smaller incorporated municipalities, was the work of the City-County Planning Board and a 21-member citizen steering committee. The plan's basis is “Forsyth County Tomorrow,” or The Vision, and is the effort of more than 100 citizens and the Legacy Steering Committee. Legacy is the road map that will move us toward this vision. Each chapter discusses the issues around a particular topic and develops a set of goals, objectives, policies and an Action Plan to turn this vision into reality.